Launch Party for Red Letter Event Planning | Project Completed! OMG the day has arrived and I am SO excited!! 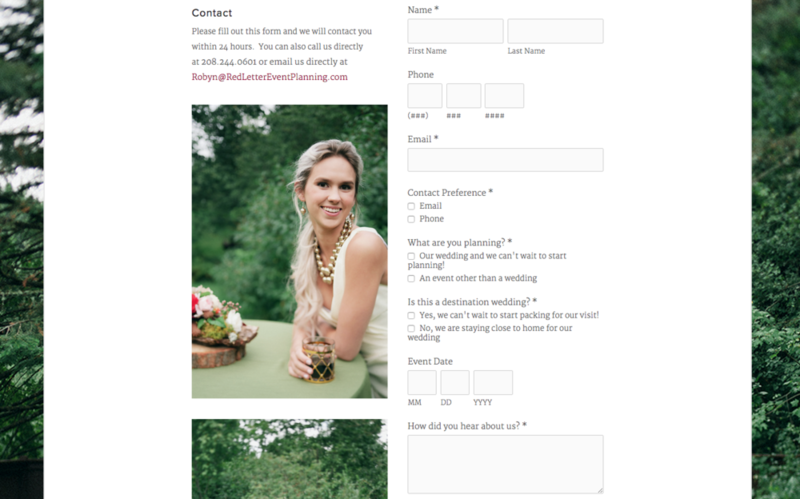 The launch of the new website for Red Letter Event Planning, a Coeur d'Alene wedding planning company. I have been working on this one for a little over a month and it's such a good feeling to be able to share it now!!! The area where Robyn creates beautiful events and weddings is so lovely that I really wanted to give a visitor the feeling that they are there ... especially since Red Letter Event Planning has a lot of 'out of town' clients who are planning destination weddings. I'm really thrilled with how this one turned out!! We still have a few more tweaks and a page or two to add, but it was ready to launch so we went for it!! TIP: if your current website isn't mobile optimized (which Robyn's old site wasn't) it's important to get as close to launch ready as you can and then JUST DO IT!! It's hurting you to have a website up that isn't mobile device friendly ... so do what you can to get a new site up and then make small tweaks and additions after it's live. Arthouse Photographs has a New Online Face!! Excited To Share This Completed Project!